September 14, 2018--I recently wrote about the ANG Seminar Ribbon Buttons I stitched (see the blog entry below dated September 5, 2018) and mentioned I knew who won the First Place Ribbon that had my name on the back as the stitcher, but didn't want to say who received it unless I had permission to do so. Well, the award winner recently wrote me to say it was OK to name names and sent along a picture of the exhibit entry. 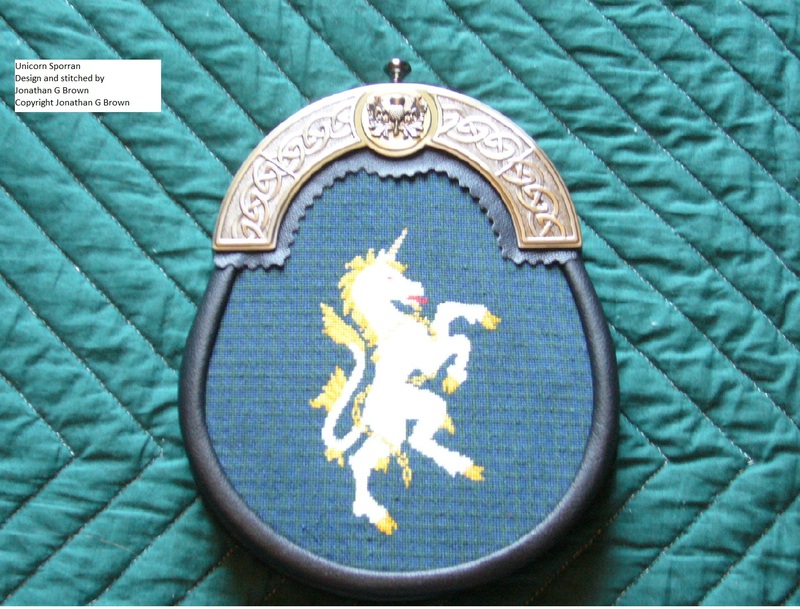 So I'm happy to report that Jonathan Brown was the recipient of the First Place Ribbon Button I stitched for his exhibit entry called Unicorn Sporran. He says "I love the hand stitched centre on my ribbon and treasure each one as an individual work of art." Thank you Jonathan--your stitching is truly amazing. September 5, 2018--I was fortunate to participate in the stitching of ANG 2018 Seminar ribbon buttons along with other members of Maryland's Checkerspot Stitchers Chapter. The first button I stitched, red and cream stripes with gold stars, was used as the center of a blue First Place ribbon. I happen to know who received this one (there was more than one blue ribbon awarded) and since my name is on the back of the ribbon button as the stitcher, the recipient will know it was me. Cool. If the recipient tells me it's OK to mention his/her name, I'll post it as a blog update. The second ribbon button I stitched depicted the Washington Monument surrounded by flags. It was made a part of the Green Delegates Choice Ribbon which was awarded to the beautiful piece stitched by Donna Pence. Congratulations! The stitched ribbons are always such an honor to receive knowing how much time and effort is taken by other ANG members. These are beautifully done. Brenda, I stitched the other Washington Monument for People's Choice. Lol.